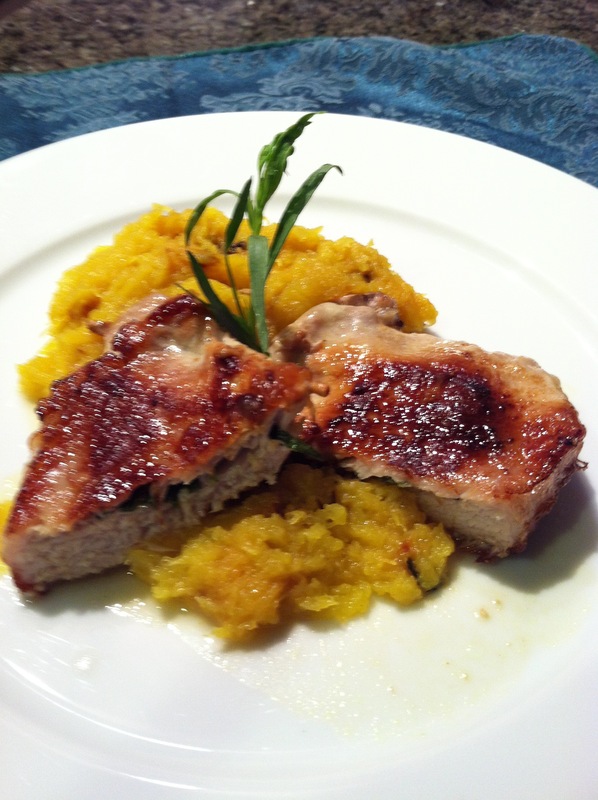 Stuffed pork is a great fall meal to prepare especially when served with roasted and mashed acorn squash. The combination of flavors from the tarragon and creamy, nutty fontina cheese adds just the right burst of flavors. Acorn squash contains many great vitamins and nutrients such as vitamin A, C, B-6, potassium and magnesium, just to name a few. These wonderful nutrients help promote the health of our immune and skeletal systems and may also help prevent heart disease, cancer, hypertension and osteoarthritis. Plus it tastes delicious! Pork, or as it is often referred to as “the other white meat” has a very nice taste and contains high levels of protein, zinc, selenium, phosphorus and various vitamin B vitamins. Just remember to purchase a lean cut or trim the fat away. The protein is used to help build muscles, the zinc promotes cell growth and boosts our immune system. the phosphorus helps build strong bones and teeth and the selenium helps protect blood vessel walls from damage.